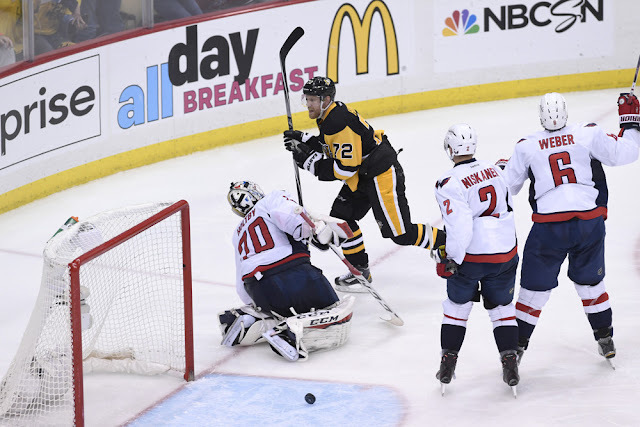 By virtue of winning Game 4 to take a 3-1 series lead, the Pittsburgh Penguins allowed themselves three chances to close out the Presidents' Trophy winning Washington Capitals. They were unable to do so in Game 5 in Washington that saw Braden Holtby make a number of key saves in leading the Capitals to a 3-1 victory, but the Pens will have the opportunity to shut the door in Game 6 on their home ice. Olli Maatta looks like he could return to the Pittsburgh lineup tonight, officially being a game time decision, while Brooks Orpik will return to the Washington lineup after serving a 3 game suspension for his hit on Maatta. The Penguins' offense had been clicking entering the 2nd round series against the Capitals, but they're still struggling to figure out how to beat Braden Holtby. The Washington netminder has posted a 0.928 SV% and 2.34 GAA through the first five games, displaying an ability to completely change the complexion of the series with his play in goal, and he was instrumental in turning aside a strong Penguins push in the second period of Game 5 to preserve the Caps' lead. They're almost identical numbers to what Matt Murray (0.926 SV%, 2.33 GAA) has accomplished for the Pens, and it's entirely possible that a series with so much offensive talent could be decided by the goalies. Pittsburgh would surely like to be able to break through on Holtby, but the charge will need to be led by the top of the lineup. Sidney Crosby (0g, 2a), Evgeni Malkin (1g, 1a), and Kris Letang (0g, 2a) haven't been able to manage to type of offensive production that has been expected of them, but the depth of the Penguin team still has them one win away from moving onto the Eastern Conference Finals. It's been in large part due to a team effort and a 3rd line that has matched up well with the Capitals. Nick Bonino (1g, 3a) and Carl Hagelin (2g, 2a) both lead the Pens in scoring this series with 4 points a piece, while Phil Kessel is right behind them with 3 assists. - Mike Sullivan made sure to nip any goalie controversy in the bud yesterday by naming Matt Murray his Game 6 starter. - Olli Maatta participated in the optional skate this morning and will be a game-time decision. - Pittsburgh is 3-1 all-time when having a chance to clinch a series at home in Game 6.